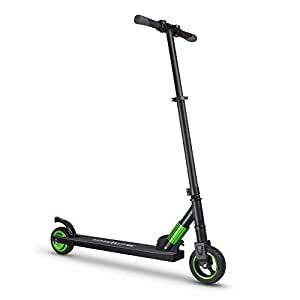 Fast & Efficient: Powered with 250W Motor & 4000Mah Battery Propels MEGAWHEELS Scooter to a Speed14 mph & 5-8 Miles Long Range, Rolling Over Inclines as Steep as 15 Degrees. Easy Fold-Carry Design, Lightweight & Portable: 18 LBS Ultra-Lightweight Folding Electric Scooter. Can be folded down quickly with Ultra-Convenient One-Second folding Mechanism, and Easy Carry to wherever you go: Office, School, Coffee Bar Gym, Subway or Elevator. Ride Safe on the Road: MEGAWHEELS E-scooter Build with Solid Aluminum Alloy Frame, Double Braking System and UL2272 Certified Battery will Make You Ride Safely on the Road. Eco Friendly&Healthy: MEGAWHEELS Electric scooter 100% Powered by Electricity Produces Zero Emission, Good for Environment & Healthy. Notice and Remind: We Highly Recommend MEGAWHEELS E-scooter for Age 10+ Teens or Weight Under 150lb Riders. Performance of Scooter May Varies by Weight or Road Condition, Make it in Full Charge Before You Riding. MEGAWHEELS has Professional Technical Support, if You Have any Question or Concern Please Send us Message. MEGAWHEELS Electric Scooter – A Real Tool for Personal Transportation Revolution! Easy Ride & Carry Transportation Tool. MEGAWHEELS E-scooter is a Very Useful Vehicle to Solve the Traffic Jam in Modern Cities. Suitable for Age 10+ Teen or Weight Under 150lbs Riders . It is an Ideal Transportation Tool for School, Work, Fitness, Short Distance Travel and Leisure with itâs Compact, Handy, Easy Carry & ride Features. The e-scooter is more cost-efficient, convenient, eco-friendly and better for the environment than any car, truck, or gas powered vehicle. Easily and quickly fold down just in a few seconds with Ultra-convenient 1-second folding mechanism, with light-weight body 18lbs, it can be convenient to store or carry anywhere you want. Speed up to 14 MPH with Powerful 250W motor, 5-8 Miles Long-Distance Battery & Climb Slopes as Steep as 15 Degrees. MEGAWHEELS E-scooter Offers Effective Double Brake System, A Motor Electronic Brake on the Handlebar and a Foot Friction Rear Brake on the Back Wheel. Get to your Destination Fast and Ride Freely Through the Streets. Brings you With More Fun, Entertainment, Convenience, Smart driving and traveling!